(Back L - R) 1Lt Edmund J. Biedanski (B), 1Lt Stephan B. Bastean (CP). (A) - Non-credit aborted missions - (#96) #2 engine and supercharger failed, (#108) Ball Turret oxygen inoperative, (#132) Restricted visibility at Molesworth made formation assembly difficult. The Harrison crew lost the formation and returned to Molesworth. (AS) - Credited abortive Sortie (#110) Could not drop bombs. Cloud cover obscured the location of any target of opportunity. Captain Emmittes S. Harrison, Jr. (P) - First mission flown as CoPilot with combat orientation Pilot, Lt George S. McClellan, Jr. Other missions flown as First Pilot. Last eight missions (145, 147, 154, 162, 176, 177, 182, 185) flown as a Lead Crew Pilot. Completed combat tour (32 credited missions) on 19 June 1944 (Mission 185). 1Lt Stephen B. Bastean (CP) - Stood down on missions 90 and 92. Flew 24 credited missions with Capt Harrison (93 through 147). Upgraded from CoPilot to Pilot on orders dated 8 May 1944 and flew ten missions as First Pilot (154, 159, 164, 169, 175, 177, 178, 182, 184, 186). Completed combat tour (34 credited missions) on 20 June 1944 (Mission 186). 2Lt Walter F. Kurnik (N) - Stood down on mission 90. Flew on 21 credited missions with Capt Harrison (92 through 128, 132, 133). Dispatched on 9 missions (8 credited) with other Pilots (117, 129, 130, 134(A), 135, 139, 140, 141, 143). Completed combat tour (29 credited missions) on 27 April 1944 (Mission 143). 1Lt Edmund J. Biedanski (B) - Stood down on mission 90. Flew on 22 credited missions with Capt Harrison (92 through 128, 132, 133, 147). Flew on 9 credited missions with other Pilots (130, 134(A), 135, 145, 147, 154, 155, 159, 160, 161). Completed combat tour (31 credited missions) on 27 May 1944 (Mission 161). T/Sgt Joseph H. Rombach (E) - Flew on 31 credited missions with Capt Harrison (Missions 92 through 185). Completed combat tour (31 credited missions) on 19 June 1944 (Mission 185). T/Sgt Lawrence O. Volmer (R) - Flew on 27 credited missions with Capt Harrison (Missions 92 through 162). Flew on 2 credited missions with other Pilots (89, 129, 134 (A) ). Completed combat tour (29 credited missions) on 28 May 19454 (Mission 162). S/Sgt James W. Dye (BTG) - Stood down on missions 104 and 108(A). Flew on 30 credited missions with Capt Harrison (Missions 92 through 103 and 109 through 185). Flew on 3 credited missions with other Pilots (155, 159, 172). Completed combat tour (33 credited missions) on 19 June 1944 (Mission 185). S/Sgt Kenneth L. Hawk (WG) - Flew on 31 credited mission with Capt Harrison (Missions 92 through 185). Flew on 1 credited mission with another Pilot (89). Completed combat tour (32 credited missions) on 19 June 1944 (Mission 185). S/Sgt Kenneth H. Campbell (WG) - Flew on 25 credited missions with Capt Harrison (Missions 101 through 162). Flew on 5 credited missions with other Pilots (129, 176, 177, 184, 186). Sgt Walter C. Campbell flew as Waist Gunner on 4 credited Capt Harrison missions (92, 93, 95, 96(A), 98). Completed combat tour (30 credited missions) on 19 June 1944 (Mission 185). Sgt Albert S. Burkett (TG) - Flew on 6 credited missions with Capt Harrison (92, 93, 95, 96(A), 98, 101, 102) and 1 mission with another Pilot (89). Completed his 7th credited combat mission on 30 January 1944 (Mission 102). S/Sgt Coster R. Vateckas (From 427th BS Lt David P. Shelhamer Crew) flew as Tail Gunner with the Capt Harrison crew on 10 credited missions(103, 108(A), 109, 110, 111, 112, 113, 118, 119, 121, 122). Substitute Tail Gunners used on all other Capt Harrison missions. 24 December 1943 (Mission 92) to Vacqueriette, France. Squadrons were unable to bomb when target could not be located. The Harrison Crew Bombardier, Lt Edmund J. Biedanski believed he positively identified the target and bombs were dropped with unobserved results. Other B-17s of the formation returned to Molesworth with their bombs. 05 January 1944 (Mission 96) to Kiel, Germany. The Harrison crew aborted the mission before reaching Denmark when the supercharger controls wouldn't work properly. A radio compass heading was followed that was supposed to bring the crew straight back to England. The B-17 had let down to 4,000 feet and islands were spotted off to the left and the crew was heading right into them. As the islands were approached (later determined to be the German Frisian Islands) a battery of twelve 88 mm flak guns opened up. Lt Harrison turned sharply and dived down to the ocean with the B-17 just clearing the waves. The Radio Operator continued to use his radio direction finder only to discover that signals were being sent by the Germans. The English direction finder was finally weakly reached and the crew was able to get a proper heading and return to Molesworth. 11 January 1944 (Mission 98) to Oschersleben, Germany. The 2nd and 3rd division received a mission recall but the 1st Division continued on to the target and German fighters attacked coming up through the clouds that were below The Harrison crew B-17 lost most of it's oxygen when lines were severed during the fighter attacks. 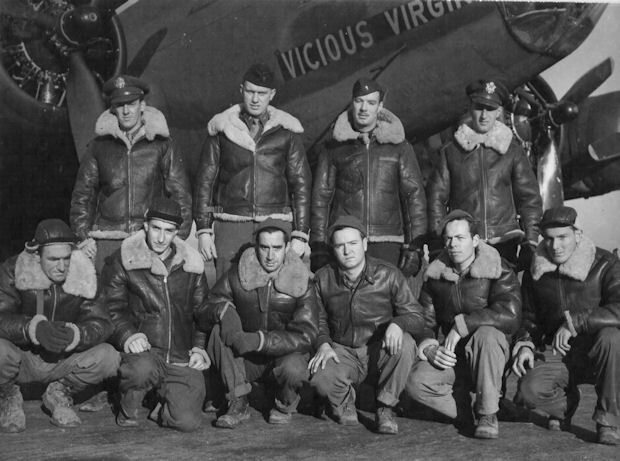 Crew members began to pass out and the B-17 descended to a lower altitude and made it back to England alone. Landing was made at Wengling when fuel was beginning to run out. Battle damage included the #3 engine hit and feathered. The two oxygen lines cut, radio room damage by ammo coming out of their boxes and flying around the B-17 due to the evasive action. 09 April 1944 (Mission 132) to Marienburg. The Harrison crew was scheduled to fly in B-17G Spirit of Flak Wolf in which they had flown 14 missions. As guns were being loaded the Operations Officer drove up and told the crew that they were to fly in B-17G #42-3158 Max. The crew rushed to the alternate B-17 only to witness that Spirit of Flak Wolf, piloted by 1Lt John J. McGarry, Jr. crashed on take-off and killing six of the crew and injuring four. Afterwards the crew wondered, if battle orders hadn't been changed, this might have happened to them. Note: Mission experiences related by Lawrence Volmer (R) in Hell's Angeles Newsletter August 1997, pages 15 and 16.